Has Your Immune System had its Breakfast Yet…? A voice on the radio asks me this as I drop my son off at school – it’s an ad for a probiotic yoghurt-type drink. I did actually remember to take my probiotic this morning and my gut is now playing host to gazillions of ‘friendly’ bacteria. I smile as I imagine these friendly little fellas being ever so nice and polite to my insides and exchanging cheerful banter with neighbouring cells and organs….. Although friendly to our insides, they helpfully want to kill the nasty bacteria that could potentially make us ill and that’s why we take them. The fact is, that your immune cells are chomping their way through the equivalent of breakfast, lunch and dinner all rolled into one – every second of every day. Silent assassins lying in wait to protect you from invading microbes. They are vitally important in digesting some of the food we eat, developing our immune system, and protecting us from harmful bacteria. Every single person has a gut microbiome that is unique to them alone, sort of like a fingerprint. 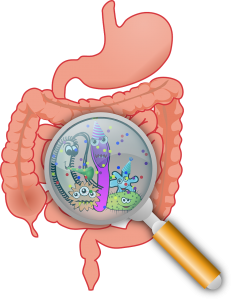 It is now thought that the microbes in the gut affect whether we develop gut diseases like inflammatory bowel disease or infectious colitis and may also determine whether or not we will develop other conditions that extend outside the gut such as obesity, cancer, anxiety, and depression – all may be influenced by the type of bacteria living in the gut…. Our bodies are constantly defending us against attack from bacteria, viruses, fungi and chemicals and it does this successfully every single moment of every single day. The body’s immune system has other ingenious weapons that it can use. Our first line of defence are barriers such as our skin, mucous, tears and saliva, together with chemical barriers such as perspiration and gastric juices. If bugs still manage to enter the body, they face the body’s next line of defence – natural killer cells. These are white blood cells (born and raised in our bone marrow, spleen and thymus gland) which act as the body’s police, army, general cleaners and repairers. Every single cell in the body has its own ‘identification papers’ which verify that it belongs inside you. No papers – no entry. The microbe is identified as an unfriendly invader (antigen) and is destroyed as quickly as possible by the white blood cells. The body’s third line of defence is the process of inflammation (swelling, heat, redness, pain) and during this process the body sends the white immune cells needed for toxin clean up and repair of the injury site. If all these measures don’t work and infection takes hold, the body has a fourth line of defence – fever. The body increases its core temperature to a point where either the growth of the invading bacteria is severely impaired or it cannot survive. Genius. We know that a healthy, balanced diet and good quality sleep can positively influence the strength of our immune system, but did you know that the hormones released during prolonged periods of stress can significantly reduce immune function by up to 60%? The first signs of this could be a sore throat, frequent colds and niggly infections. It takes an awful lot of your energy to operate an efficient immune system, so when we go through periods of stress our bodies diverts energy to those body systems needed to cope at that moment while other body systems such as the immune system and digestive system are suppressed. Incorporating regular reflexology into a healthy wellbeing regime can help your body out of the stress response back to a place of physiological balance. This in turn will will help the free flow of energy back to those body systems which have been suppressed – bringing your immune system back online.